In 2014, Architect of the Capitol Stephen T. Ayers stood before a large group of bicycle enthusiasts to accept a Bicycle Friendly Business Honorable Mention Award from the League of American Bicyclists. In his speech he challenged his staff to get the Architect of the Capitol (AOC) designated as a Bicycle Friendly Business. Later that day, the AOC Bicycle Advisory Committee was born. 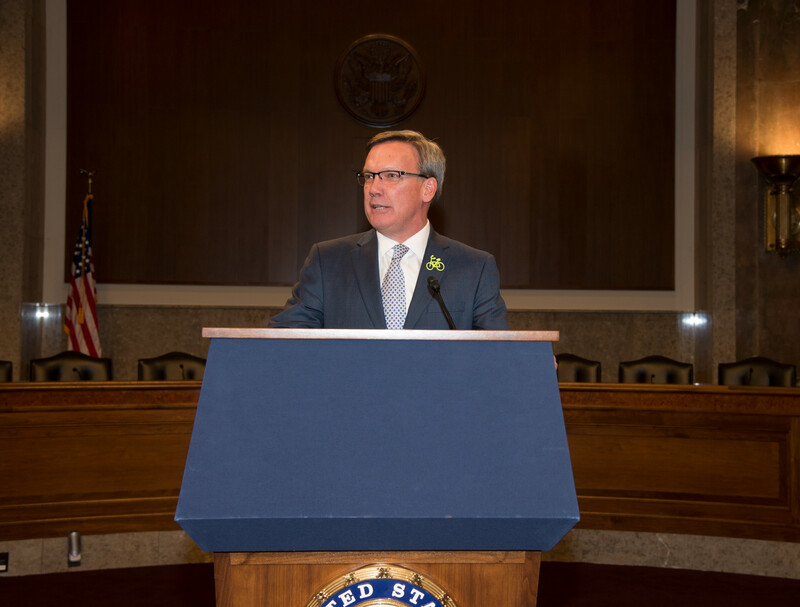 Ayers speaking at the 2016 National Bike Summit reception. The group, affectionately called the BAC, started with AOC employees passionate about biking who wanted to improve biking conditions around the campus. The BAC has grown substantially over the last two years, in participation and scope, but the original focus never faltered. After much dedication and hard work, the BAC was elated this past summer when the League of American Bicyclists designated the AOC a Bronze level Bicycle Friendly Business. The League of American Bicyclists recommends that businesses focus on the "5 E's: Engineering; Education; Encouragement; Enforcement; and Evaluation and Planning." The BAC initially focused on education with numerous articles on everything from different rules of the road to fun stories of family rides. The BAC hosts a variety of classes offering practical advice or detailed instruction on biking and basic bike maintenance. To encourage more riding, the BAC hosts monthly bike rides to interesting and educational areas of the city. 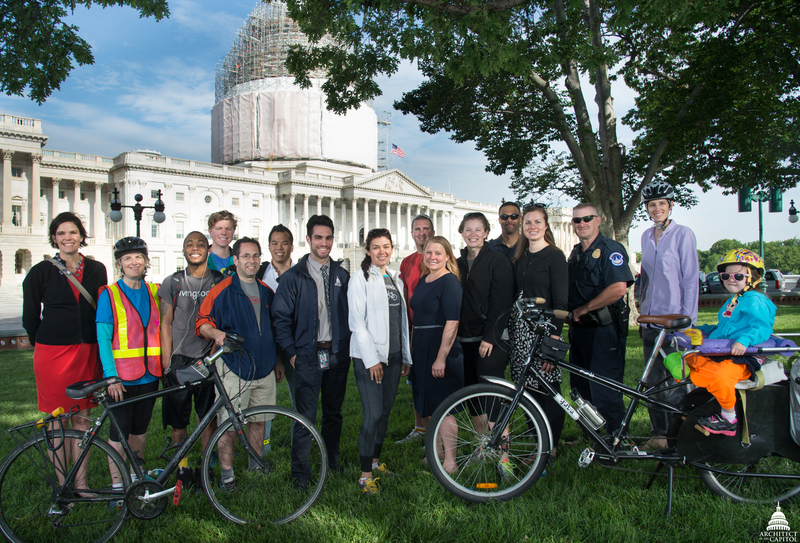 A notable success of the BAC is the relaunch of the Interagency Federal Bike Working Group with the goal of sharing best practices and encouraging biking throughout the federal workforce. 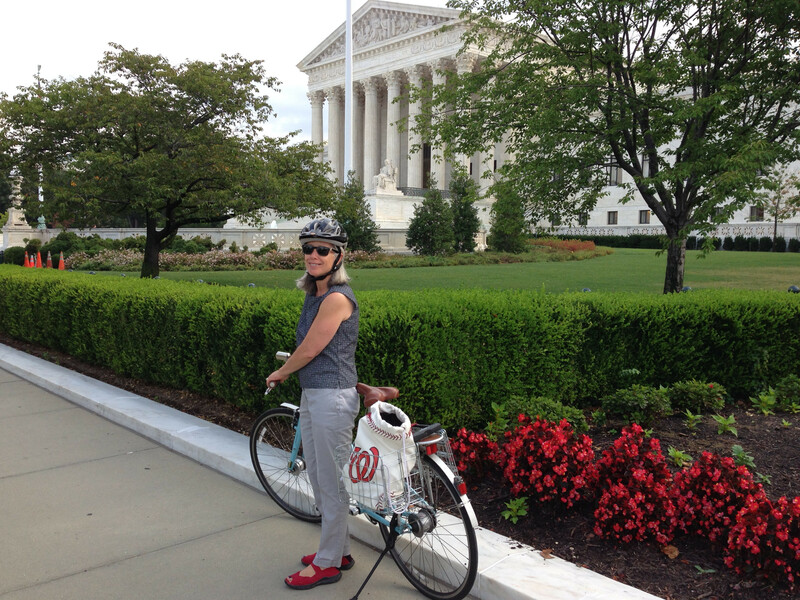 AOC employee MJ Pajak bikes to work on the Capitol campus. While several members of the BAC are engineers, the League of American Bicyclists' engineering focus has proven challenging due to the historic and security-driven nature of the Capitol campus. The BAC successfully installed bicycle maintenance stands in three garages and was able to get bicycle lanes added on some of the streets surrounding the U.S. Capitol. Not a group known to rest on its laurels, the BAC is engaged in evaluation and planning by surveying AOC employees to gauge progress and create goals for the future. The AOC employees who participated in Bike to Work Day last year. The 2016 Bike to Work Day is Friday, May 20. What I love most about the BAC is that it's such an amazing example of how a diverse and passionate group of AOC employees can go above and beyond their regular jobs and make a difference. Each member of the team has a different level of biking expertise and interest, from riding several miles each day year round, to just riding for fun on the weekends. Regardless of the level of riding, the BAC respects and supports each other in a shared mission to encourage more people to make biking part of their lives.